Gallant, affable and successful restauranteur Ashok Bajaj has maintained 701 Restaurant's place in the D.C. dining scene. But steady isn't good enough for Bajaj, whose recent victory at the James Beard Foundation Awards (his chef Vikram Sunderam of the brilliant Rasika won for Best Chef: Mid-Atlantic) doesn't dim his fervor to pursue excellence at each of his restaurants. Bajaj's hunger -- pun intended -- to find the best chef talent extends to 701 Restaurant's (701 Pennsylvania Ave NW) new executive chef, Benjamin Lambert. Formerly of Four Seasons Baltimore's Wit and Wisdom, this young chef's talent was self-evident in his summer menu unveiling. In the first course, classic asparagus was artfully presented. A single, healthy stalk of white asparagus was dressed with precise sections of Camembert cheese, Serrano ham, and black truffle, all presented to resemble a decadent modern art sculpture, pleasing to the eye and palate. 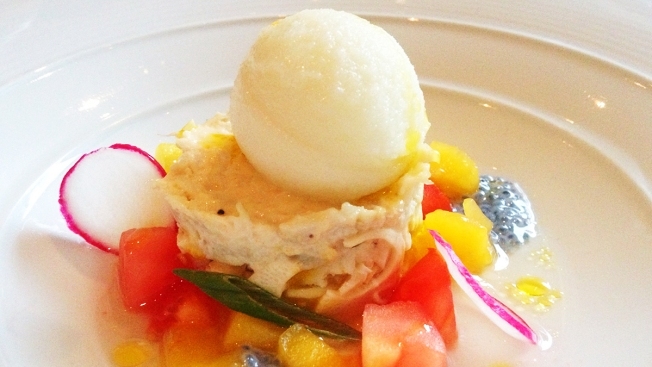 I was particularly smitten by the second-course lump crab, a gorgeously arresting dish. Presented in a splash of vibrant colors including bright blue basil seeds, Yuzu, mango and cold hearts of palm, the course was so fresh, airy and sweet, it felt like a brilliant burst of summertime. Lovely. For the third course, there was the Thai snapper, presented gracefully on a bed of shredded carrots, with two Thai basil leaves cohabiting on top. Coconut and lobster XO sauce helped round out the comforting favor. Without question, I found this a soothing Thai dish without the searing heat that occasionally makes Thai food a bit uncomfortable to eat. For red meat lovers, the fourth course of prime beef sirloin was a tasty medium rare. American beef, I find, is not always as flavorful as a Japanese wagyu, but Lambert's beef was fine and, in yet another artful dish, the beef was arranged on a single crispy potato, with a deconstructed look to the accompanying red onion and beef cheese Sabayon. Each of the courses was wonderful in both presentation and flavor. The same can be said of the chef's selection of desserts, including my favorite banana cake, and the delightful beverage menu. Signature cocktails to order definitely should include the Seabees Knees, made with Leopold Bros., Navy-strength gin, lemongrass honey and citrus. The bright freshness of the drink seemed more non-alcoholic, which makes it the perfect summer treat! For those, who prefer a lower-budget option to the decadent 701 menu, Bajaj and Lambert offer a great concept in their new three-course Sunday sSupper menu. Diners can order one appetizer/salad/soup, one main dish including the aforementioned steak course, and a dessert for $35 ($55 with a bottle of wine). Either way, it's compelling to note Bajaj's continued push for excellence and no doubt he has found another James Beard award winner in Chef Lambert.